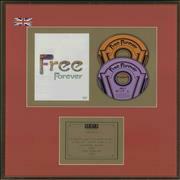 Lots of Official Award Discs here... 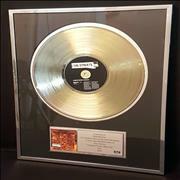 The RIAA Gold and Platinum Awards program was launched in 1958 in an effort to create a standard by which to measure sales of a sound recording. 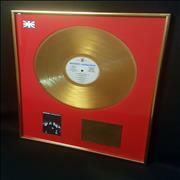 In the beginning, there was only a Gold album award for the sale of 500,000 copies. As the industry grew, other awards were developed. 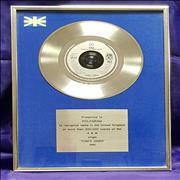 The Platinum award (1,000,000 sold) was created in 1976 and with the advent of the compact disc and the subsequent increase in sales, the Multi Platinum award was created in 1984. On March 16, 1999, the RIAA launched the Diamond Awards, honoring sales of 10 million copies or more of an album or single. 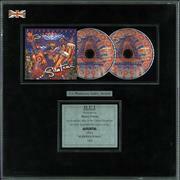 BPI (The British Phonographic Industry) certified awards were originally introduced in April 1973 to measure the performance of individual records based on sales to the trade each week. Qualification for albums was initially on the basis of revenue received by manufacturers, and in January 1978 the BPI abolished the old monetary system for albums and replaced it with a unit system. This brought album awards into line with singles and also with other countries where qualification levels are based on unit sales. 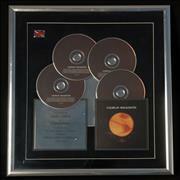 Multi platinum awards, introduced in February 1987, are any multiple of the platinum level, e.g. 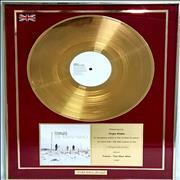 album quadruple platinum status = 1.2m.